ABS Apprentice Bladesmith Dave Armour has forged a Drop Point Hunter with a Damascus blade from 1084 & 15N20. 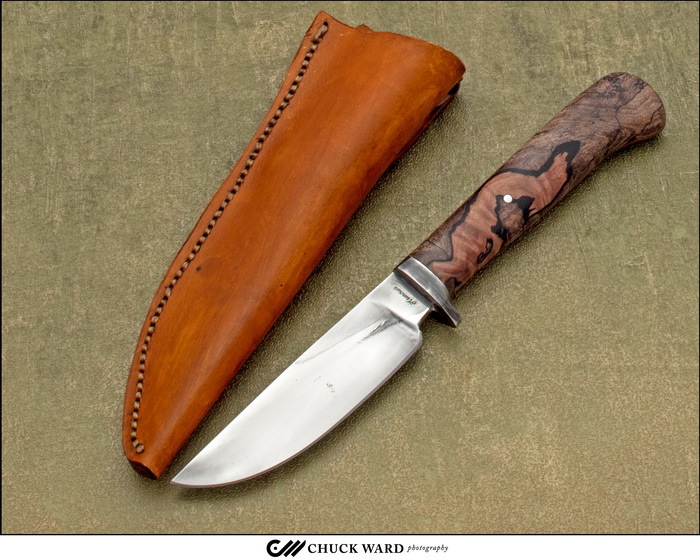 The handle has a 1084 half guard with Stabilized Spalted Maple. A leather sheath my the maker is included. I’m Dave Armour, Bladesmith and Chief of Staff (All right- I’m THE staff- at least I get to boss myself around) of Armour Cutlery. I’d like to claim my knives were made through some mystical and enchanted process, but they’re not. I start out with a bar of steel, forge it to rough shape, and grind off what doesn’t look like a knife. Once I’m done with grinding I drill any holes, do an initial polish to 320 grit, and then stamp my blade with my name prior to heat treating. Most of my blades are differentially hardened before tempering to give it the balance of edge holding versus toughness appropriate for that style. Then it’s back to the sandpaper to finish the blade. I’ll fit a guard or bolsters if the design calls for one, epoxy on the handle, and do any handle shaping and polishing needed. The last step before sharpening is creating a leather or Kydex sheath for the knife.